Where would we be without music? I don’t know for certain, but I do know that I wouldn’t want to find out, either. Several times before I’ve written about the impact of music on tattoos and that concept shows no signs of ever disappearing. It actually seems that the more popular tattoos get, the more news I read about people with music related tattoos. There’s a different sort of intrigue with music tattoos than with any other type for the simple reason that music means something very different to everyone. 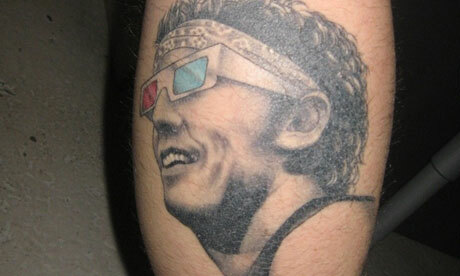 A song that might remind one person of nothing more than drinking beer and partying could potentially be another person’s wedding song, just as someone who loves Bruce Springsteen enough might think it’s the greatest thing ever to have a portrait of The Boss wearing 3D glass on their calf. You just never know. Which brings me to my second point: finding out why people get the musical tattoos that they do is to me, more interesting than finding out why a person gets any other sort of tattoo. First of all, who isn’t interested in what kind of music that their friends listen to? I’ve always believed that you can tell a lot about a person based on what sort of music they listen to. So finding out why a person gets a tattoo of a particular band or musician can not only tell us a lot about the person wearing the tattoo, but we’re also typically provided with an interesting story or two. The British newspaper The Guardian has managed to put together a short piece in which people with music relevant tattoos are interviewed and their tattoos are explained. This makes for some interesting reading, especially with the part about Ryan Duffy’s aforementioned Bruce Springsteen in 3D glasses tattoo.